Do you like Kit Kats? What about Japanese Kit Kats? To mark the 45th anniversary of when the chocolate treats first went on sale in the country, a special set of 35 Kit Kats is going on sale in Japan. There are an array of Japanese centric flavors, including sweet potato, Japanese strawberry, momiji manju, several different green tea variations, roasted green tea, sweet bean paste sandwich, Nagano apple, umeshu, sake and even wasabi, among others. 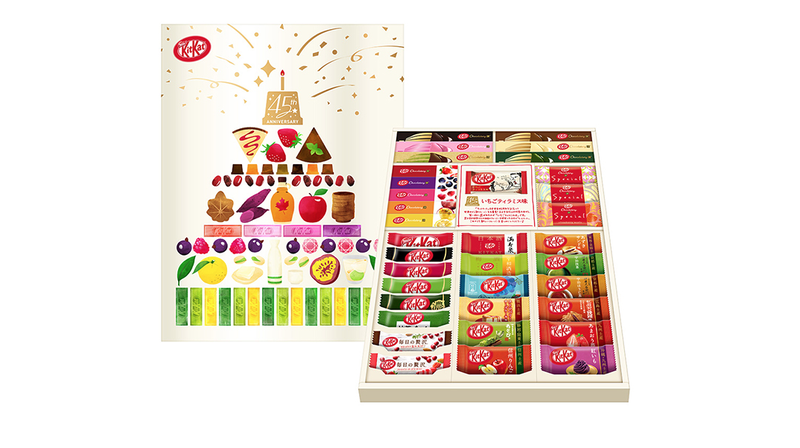 The Kit Kat anniversary is currently on sale in Japan (and in Japan only) at the Kit Kat Chocolatory specialty shops.